Common Mynahs are known to have a wide range of vocalisations. We believe that, as far as possible, animals rescued from the illegal wildlife trade should be sent back to their country of origin, and hopefully even returned to the wild. 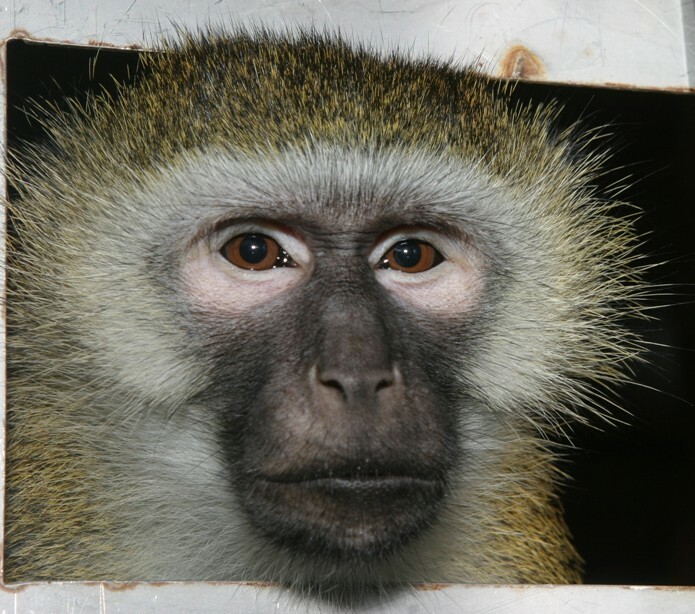 ACRES has organised the repatriation of two primates: Blue the vervet monkey and Asha the rhesus macaque. The repatriation of Blue was the first ever repatriation of a confiscated pet primate from Singapore! 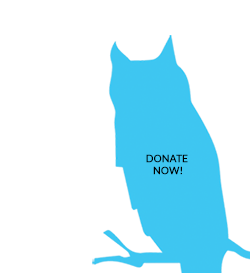 Thanks to ACRES supporters, both Asha and Blue now live happy, enriching lives at rescue centres in Africa and India respectively. In the future, ACRES will be organising more repatriations of animals rescued from the illegal pet trade in Singapore, to rescue centres in the countries where they belong. Blue’s story is one that is very special and close to our hearts, as he is the inspiration behind the ACRES brand. 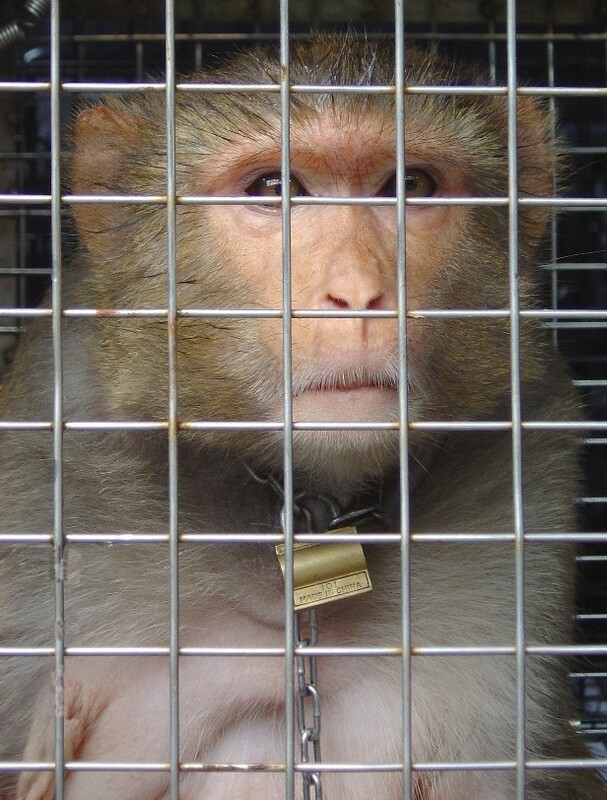 When we first met Blue, he lived alone, in a small cage, attached to the bars by a chain around his neck. It was no life for a free-spirited monkey like Blue. The short chain attached around his neck meant there was no way he could move more than a few steps in either direction. Even if he could somehow remove the chain, Blue’s world was just a 1.5 x 1.5m x 2m barren cage. There were no fruits for him to pick, no branches to jump between, no friends to chase or groom. If he was lucky he might find some insects to catch and eat, or a leaf might drift into his cage for him to play with. Rescuing Blue from the cage wasn’t difficult. But finding a place for him to stay in Singapore was another matter. Inevitably, Blue had to return to his native Africa. We embarked on a mission to raise the funds needed to send him back home. It was a mammoth task, but in 2004, thanks to the generosity of ACRES supporters, Blue got his second chance at life, and was on his way to his new home at the Munda Wanga sanctuary in Zambia. Blue’s days are now very different. Blue’s home today is a huge open enclosure, with the view of endless sky up above and all around. Blue now fills his days running, jumping, climbing, leaping, foraging – all the things a monkey is designed to do. Best of all, Blue has the thing that makes him a wild monkey again – company and a family of his own. Blue and his mate Toni spend blissful hours grooming each other and watching over their young offspring Indigo and Sapphire, safe in their sanctuary home. On behalf of Blue, ACRES would like to thank Stichting AAP for funding his repatriation. We also thank the International Primate Protection League, Gorilla Haven and all the ACRES supporters who provided additional funding and contributed towards giving Blue a new lease of life. We also extend our appreciation to the Singapore Zoo for caring for Blue after his confiscation and helping us with the logistical arrangements. Words from our Chief Executive: Blue Goes Home! In May 2003, I met Blue, a young vervet monkey from South Africa. We didn’t meet in the best of circumstances. He was chained up and housed in a rusty cage in a factory in Tuas, and I was there to drag him out of his home. 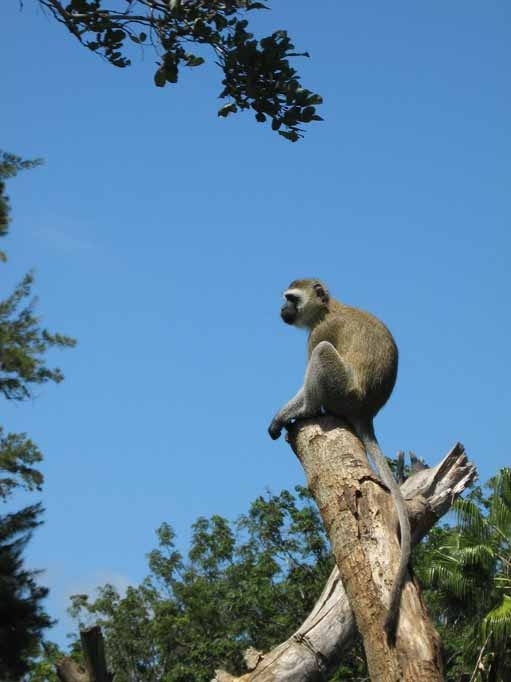 His owner had informed the International Primate Protection League (IPPL) about her pet vervet monkey, and asked if IPPL knew of a home for Blue. 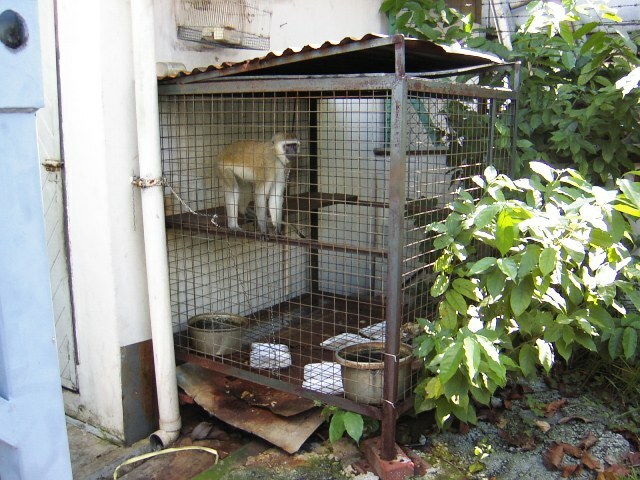 Keeping primates as pets in Singapore is illegal and IPPL forwarded the information to ACRES. After months of investigation and negotiations with the owners, we were finally brought to the place where Blue was kept, to do a confiscation, together with the Agri-Food and Veterinary Authority (AVA). So here I was, looking at Blue, and wondering how in the world I was going to get him out of his cage without getting bitten. It took us half an hour but we finally managed to get him into our cage. Blue then spent the next three days at my house before being sent to the Singapore Zoo. In these three days, we bonded and groomed each other. Gone was the aggressive Blue who was biting people. I always believe that animals know when we come to help them and in this case, after some time, I was sure that Blue understood what I was doing. It has taken a whole year of work and in May 2004, Blue was finally repatriated to the Munda Wanga Sanctuary in Zambia. I followed him on the same flight, like a worried parent. I checked about a hundred times, to make sure he boarded each flight, made sure he got water and made sure they fed him during transit. We finally arrived at Munda Wanga on 5 May 2004, 16 hours after leaving Singapore. Blue survived the long flight and I truly hope that this would be the end of his long, arduous journey. Like Ramba, he had lived through a horrible childhood. At a young age, Blue was forcefully separated from his family and had to endure a long journey on a ship from South Africa to Singapore. His owners in Singapore chained him up and housed him in a cage. When we rescued him, he was only 4.2kg. By the time he was sent to Zambia his weight was 7kg. After three weeks of quarantine at the sanctuary, he will be introduced to Chippy. 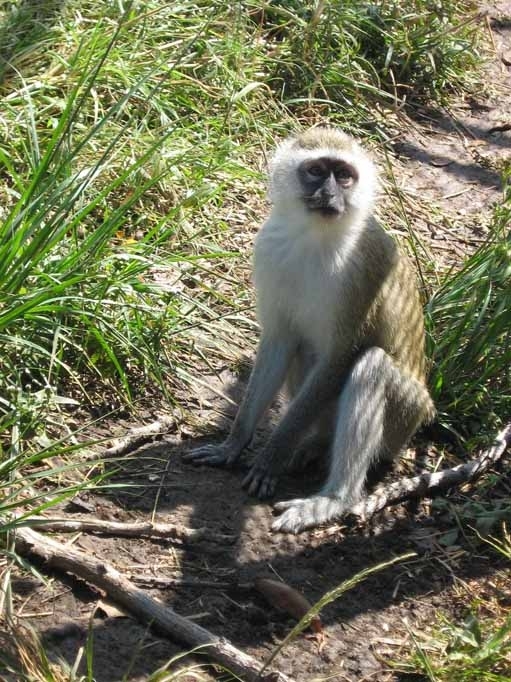 Chippy is a young male vervet monkey who was brought in by some locals who found him injured in the bush. Chippy and Blue will spend a few months together before being released into a newly built, large, open topped, electrified enclosure. It’s a happy ending for Blue but countless others have lost their lives in the illegal pet trade. Each year, thousands of animals are captured from the wild for this illicit trade. Removing these animals from their natural habitat damages the fragile ecosystem as well as threatens the species’ existence. More than half of these animals die during transportation and the surviving animals mostly end up living in bad conditions or are mistreated. We urge you not to buy these illegal pets and to please spread the word around. I left Zambia with a heavy heart. Honestly, it was hard to part with Blue. I felt bad leaving him there to fend for himself. He gave me one last groom and I gave him one last groom. I wish him all the best and hope he does well socialising with other vervet monkeys. It won’t be easy but it is time he found out that he is a vervet monkey, after all these years of living with humans. 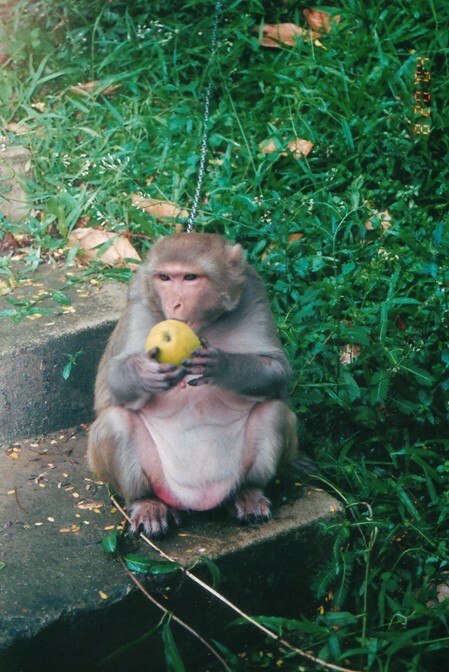 Asha the rhesus macaque was a lonely, unhappy soul when we met her in 2004. At the time she was being kept as a pet at a warehouse area in Singapore, and a phone call had alerted us to her plight. We found Asha tied to a tree by an uncomfortable heavy chain around her neck, which meant she could hardly move around. She had become very overweight and unfit as a result. Her only shelter was a small makeshift shack, which offered no respite from the heavy tropical rains. Food was the only interesting thing in Asha’s life, and eating was just about the only thing she could do; so it was no surprise that she was almost twice the size she should be. Asha had no companions, and what a social macaque like Asha needs, more than anything, is other macaques to play with, groom, sleep together with and just provide companionship. It’s hard to imagine how sad and lonely Asha must have felt. A non-native species, Asha was probably smuggled in to Singapore as a baby by ruthless animal traders before being sold illegally as a pet. ACRES alerted the AVA to Asha’s plight, and soon afterwards Asha was confiscated and rescued from her sad existence. 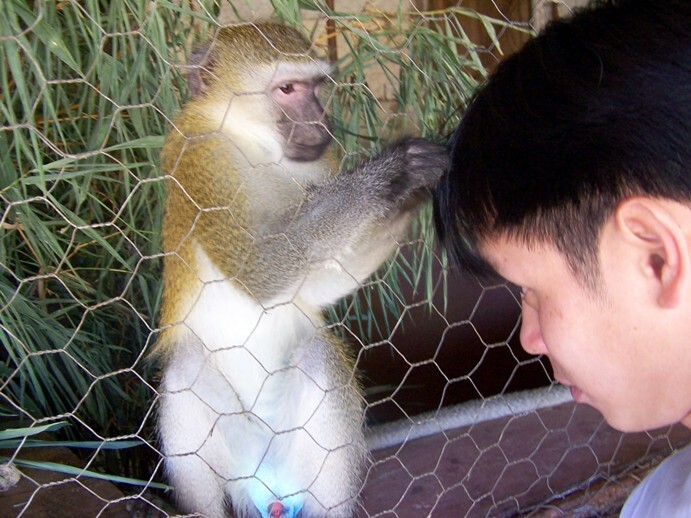 As Singapore had no dedicated rescue centre for confiscated primates at that time, ACRES promised to find a new safe home for her, so that she would not be euthanised. The Singapore Zoo kindly agreed to house her until she could moved to a new permanent home. However, Asha’s story clearly illustrated the need for a dedicated rescue centre in Singapore to act as a halfway house for animals rescued from the illegal wildlife trade who are awaiting repatriation to their country of origin and, together with Blue’s story the year before, was the main reason we decided to establish the ACRES Wildlife Rescue Centre. We asked our friends at Wildlife SOS in India if they would be able to give Asha a home and, wanting to help Asha, they said yes! However, that was just the start of the long road to getting Asha home and it took months and months of letter writing, email correspondence and phone calls to get all the permits necessary to send Asha back to her native India. On the 19th of May 2006, nearly 20 months after her confiscation from the illegal pet trade, Asha finally left Singapore shores for her new life with Wildlife SOS! After arriving in India late at night on the day of her journey home, we stayed with Asha until she was safely on her way to the Delhi Zoo for her necessary period in quarantine. Early the next morning, we hurried to the zoo to check if Asha was ok and were relieved to see her looking relaxed and content, happily munching on her food and playing with the branches and leaves decorating her cage, none the worse for her ordeal. She even allowed us to groom her which was quite amazing as she had been previously been very aggressive towards people. After her period in quarantine, Asha went to live at a new, specially built enclosure at the Wildlife SOS rescue centre in New Delhi, where she now lives happily with many other macaques and has become an adoptive ‘mum’ to many of the little ones, taking them under her wing! At last, Asha has a secure future in a permanent home at a sanctuary, living with others of her kind, and having a second chance at life. It took a lot of hard work and invaluable help from some true animal friends to finally get through all the paperwork and red tape to get Asha back to India, plus a considerable amount of money. Agri-Food and Veterinary Authority, Ananda Bhavan Restaurant, Andrew Wang and his expedition team, Dawn Lee, Dilip Khatau, Florence Lee, Geraldine Brogden and her class at UWCSEA, Indian Wildlife Authority, John Chan, Loo Hwei Kwin, Maneka Ghandi, Marie Gupta, Meridian Junior College (Class 05S312), Kartick Satyanarayan, Singapore Zoo, Sri Sreenivasa Perummal Temple, Wildlife SOS, Zarin Patel.